Is there such a thing as a best girls bike? And should we even be asking the question as a bike is a bike, and surely it should be good for either a boy or a girl? The problem however is that if you're looking to buy a bike for a girl and don't know what you're looking for, someone is going to try and sell you a "girls" bike with a name like "Princess", "Cupcake", "Sweetie" or "Flower". I don't know about you, but when I ride my bike I'm certainly not a cupcake, and the girls featured in this article aren't either!! 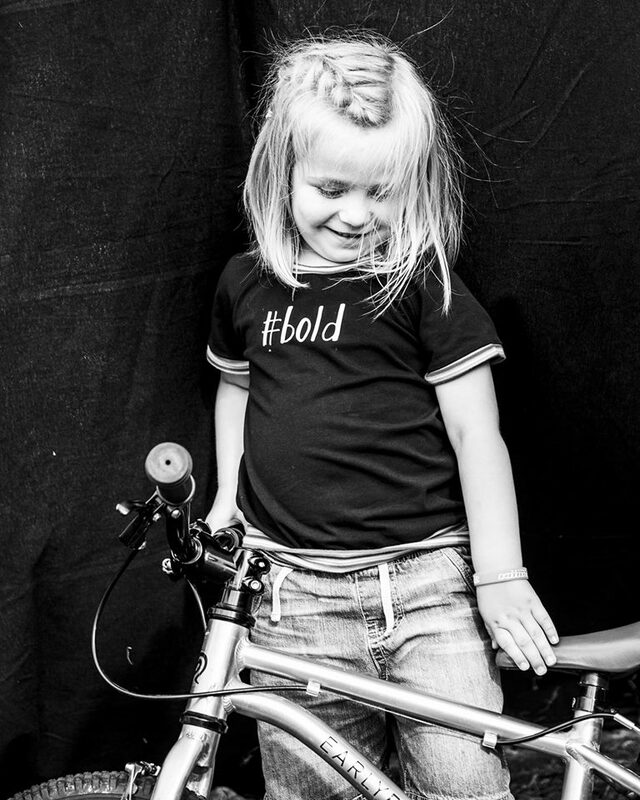 All the pictures of the girls riding their bikes in this post are of the real offspring of Cycle Sprog followers, such as Arizona (aged 4) above (photo credit David Goldman). Experience tells us that parents who make a move from a "princess" or a "cupcake" bike to one that's designed with the rider in mind tend to be awestruck by the difference in their daughter's cycling ability, the amount they want to ride their bike, their confidence and just their new found enjoyment of cycling. If I had a pound coin for every person who's said to me "I just didn't realise before" then I'd be very well off indeed! So if your daughter, granddaughter, niece, etc. has yet to experience the joy that cycling can bring then this article is for you. So, what makes a good girls bike? It's got to be light enough that she can pick it up and manoeuvre it easily. If you struggle to lift her bike up, then how is she going to cope with steering it and picking it up off the ground? It's got to have brakes that work easily. Are they sized appropriately for her hands and can she stop really quickly in an emergency? It's got to be easy to ride - do the pedals and wheels turn freely? If it has gears, can she operate them and do they change smoothly without any fuss? These three things should never be compromised - if your daughter/granddaughter / niece / etc. can't control the bike or brake properly, then the results don't bear thinking about. Speed - a lighter bike will go faster! Do you really want her to be the one at the back of the pack, pedaling away furiously on her princess bike? Gender Stereotypes - pink, flowery and looking lovely is for girls, going fast and getting muddy is for boys. Really??? Check out the girls in this post if you have any doubts. Some wear pink, some wear blue. Some wear lycra, some wear skirts. Some race, some enjoy riding at a more leisurely pace. Some ride on tarmac, some ride through mud. What they all have in common is they love riding their bikes, whatever they're wearing and wherever they're going. Price - as manufacturers and retailers realise that parents are demanding well designed and easy to ride bikes for their kids then the choice is increasing, and there's more cheaper well designed bikes available. However, don't forget the idiom 'you get what you pay for' as bikes at the cheapest end of the spectrum are that price for a reason. You're better off buying a quality second hand bike than a poor quality new one. End of season sales are a good time to snap up a bargain too, as you can often pick up an old model really cheaply. In our humble opinion, the following things aren't needed on a kids bike. You don't tend to find them on bikes marketed at boys and you won't find them on the bikes the Cycle Sprogs featured on this page are riding. What's the best colour for a girls bike? On this, it's a total matter of preference - there's fabulous bikes out there in every colour, from pink to blue, from purple to green. Some with patterns, and some plain. You may want to think of the colour preferences of younger siblings, or whether you're restricting your market when you come to sell on. What type of bike is best for a girl? This depends on what type of riding she's going to be doing. For everyday riding we always recommend a flat handlebar hybrid bike with a multi-purpose tyre (such as the Kenda small block 8) that will allow her to ride on tarmac, gravel and grass. However, once she's decided what type of cycling she wants to do you can start looking at road bikes, cyclo-cross bikes, BMX, track and mountain bikes, with these bikes coming online for those aged around 7 upwards. Of course, the golden rule is a girl can never have enough bikes!!! So, now we know what to look for (and what to avoid), what brands make good bikes for girls? Here's a selection of bikes that Cycle Sprogs are enjoying riding. It's by no means exhaustive but should give you a good indication of the types of bike that girls of all ages are having great fun riding out there. It's in alphabetical order - let us know if we've missed your favourite out and we'll include it. As every bike brand has a range of sizes and prices we've categorised them from £ through to ££££ as to where each brand sits on the price spectrum. Frog Bikes do a huge range of kids bikes from different sized balance bikes for very young children, through to large framed bikes for teenagers, all in a fabulous range of colours. They're available on-line and via a network of local bike shops. Frog Bikes cover virtually all types of cycling, with starter bikes with a single gear, hybrid bikes, road/cyclocross bikes, mountain bikes and track bikes in their range. We've reviewed lots of different Frog Bikes over the years and are always happy to recommend them. Here's 7 year old Mia riding her Frog 55 at the Three Sisters Race track. She's had it since she was 6 and loves it so much she's about to move up to the next size. Frog Bikes are available from Tredz who offer free home delivery. The original quality kids bike, Islabikes rewrote the rules and it's thanks to them that there are now so many great kids bikes around these days. They are a firm favourite amongst Cycle Sprogs of all ages due to the quality of the build and the range, which includes balance bikes, hybrid, mountain and road/cross bikes. We've reviewed most of the different Islabikes and have nothing but huge amounts of praise for them. 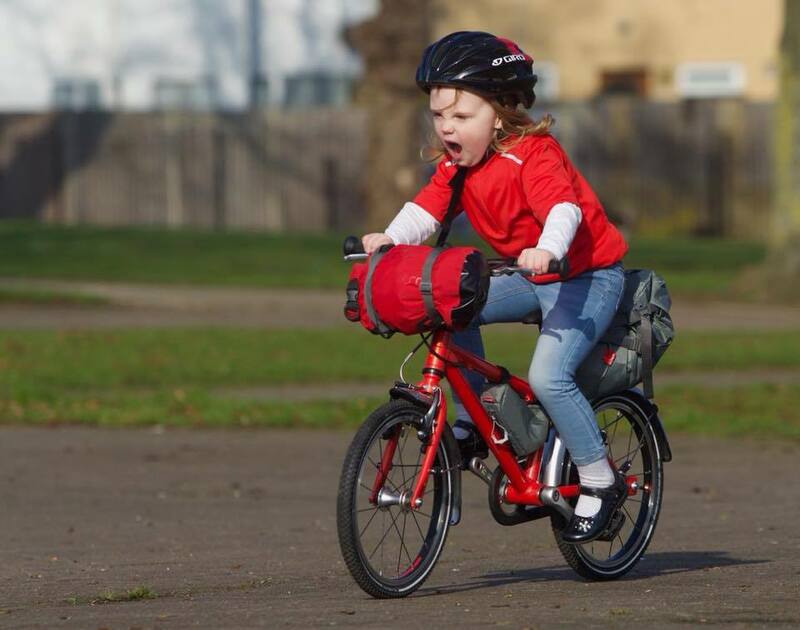 Here's Ruth (who you can read more about on the Family ByCycle blog) demonstrating that you're never to young to go bike packing on an Islabike. And here's Lorraine's 8 year old daughter racing on her Islabikes Luath road/cross bike. Islabikes are available from the Islabikes website for home delivery or collection from their Ludlow showroom. Sir Chris Hoy's range of kids bikes have had a revamp for 2018 and are now some of the lightest kids bikes on the market. Their flat handlebar Bonaly bike ranges in wheel size from 16" through to 26" and certainly gets the thumbs up from Rachel's five and a half year old daughter. They also do a drop handlebar gravel/road/cross bike for older kids. We're reviewed several Hoy Bikes and have been really impressed. Hoy Bikes are available from Evans Cycles, for home delivery or collection in store (where they will assemble the bike for you). Squish are relative newcomers to the kids bike scene, only launching in 2017. They're lightweight and reasonably priced, and have that elusive bike - a lightweight 18" wheel - the Squish 18. Here it is demonstrated by 6 year old Katherine. We reviewed this particular Squish 18 bike and were very pleased with the bike, which is a great specification for the price. Squish Bikes are available from Tredz, who offer finance arrangements and free home delivery. If you use the code SPROG10 they'll give you 10% off too! Saracen have a rich history as a mountain biking brand, so it's not surprising that their kids range takes inspiration from that. Here's Ruby mastering her riding skills on her Saracen, which was handed on down from her brother. It's always a good sign when a bike lasts several children. Saracen bikes are available from Tredz, who offer 0% finance and free home delivery. Use the code SPROG10 at checkout to get a 10% discount. 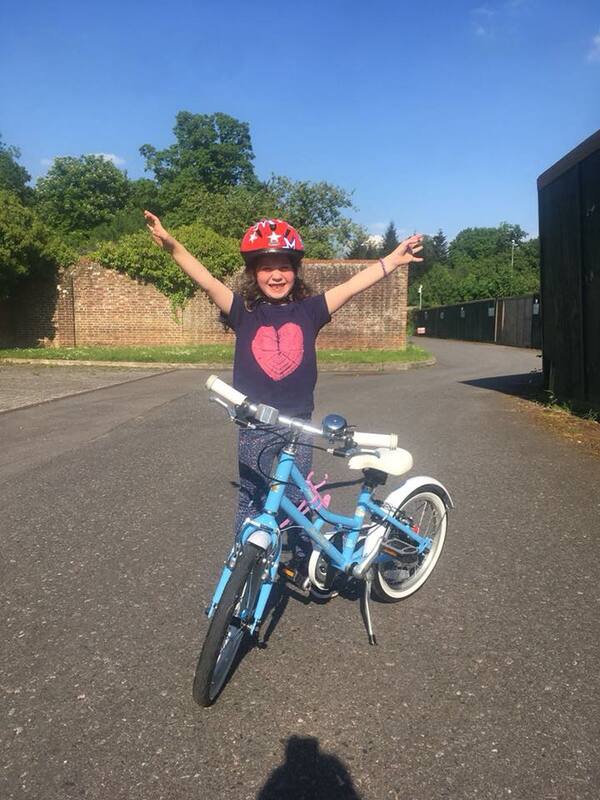 One of Britain's most successful cyclists (9 world titles plus Olympic, European and Commonwealth gold medals in the velodrome) has her own range of bikes at Halfords and they've certainly inspired Claire's daughter with her cycling. The Victoria Pendleton range is available at Halfords, who will deliver to your home or you can collect from your local store, where they will assemble the bike for you. Vitus Bikes are an in-house brand of Wiggle / Chain Reaction Cycles and are a well specified, lightweight range of bikes at a competitive price. Here's four and a half year old Holly enjoying a ride out on her Vitus 14, which she found a really easy transition from her balance bike. Vitus Bikes are available from Wiggle and Chain Reaction Cycles. They come delivered with a pedal tool, touch up paint and a multitool. A relatively newcomer to the UK market, Austrian Woom bikes are built with a high attention to detail, are incredibly lightweight and come kitted out with top quality components. They're a good choice for everyday cycling in all weather conditions as 5 year old Jess demonstrates. She's reviewed a couple of Woom Bikes for us, and was really impresssed with their performance. 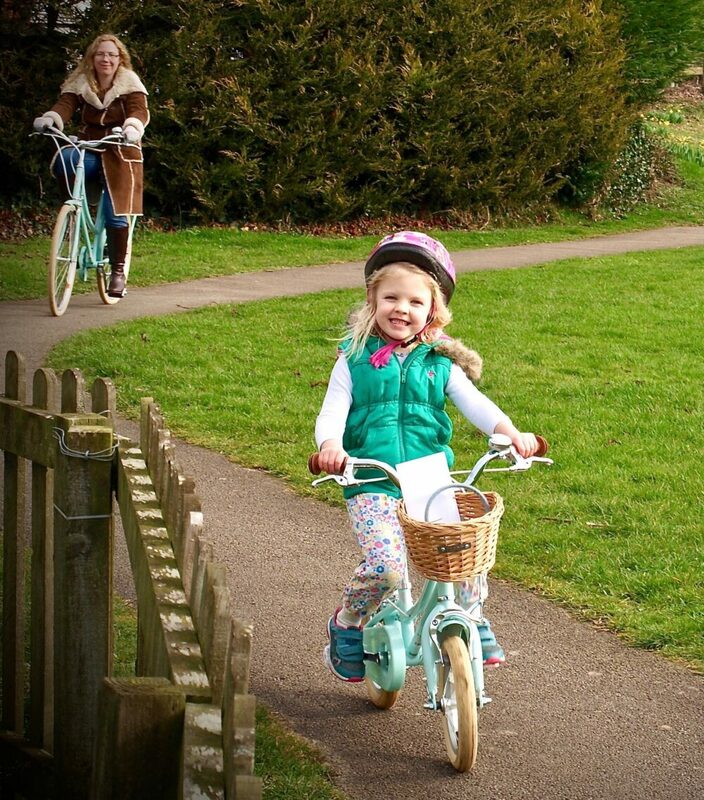 Woom Bikes are available from The Little Bike Company, who offer free home delivery. Bobbin Bikes are a great bike for girls who are going to be doing most of their riding on roads and cycle paths. Bobbin Bikes have an upright riding position influenced by the Dutch style city bikes, which is good for posture, visibility and comfort. They're not the lightest bikes featured, but that doesn't matter if you're not climbing hills or racing fast. Their range of kids bikes co-ordinate with their adult range too! Here's Ellen and her mum demonstrating how much fun they are to ride. They reviewed both the adult and child Bobbin bikes for us and were impressed with their performance as a city bike. Bobbin Bikes are available from the Bobbin Bikes website. If your daughter is into design, then she'll be blown away by the Early Rider bikes. The sleek lines of the aluminium frame coupled with innovate rubber drive trains rather than oily chains make these a great choice for girls who like to be different from the rest of the class. As you can see, 4 year old Arizona is definitely a fan - here she is enjoying the run and ride race series at Cannock chase (photo taken by Peter Wilkes Photography, who also arranges the racing). Early Rider Bikes are available directly from Early Rider. 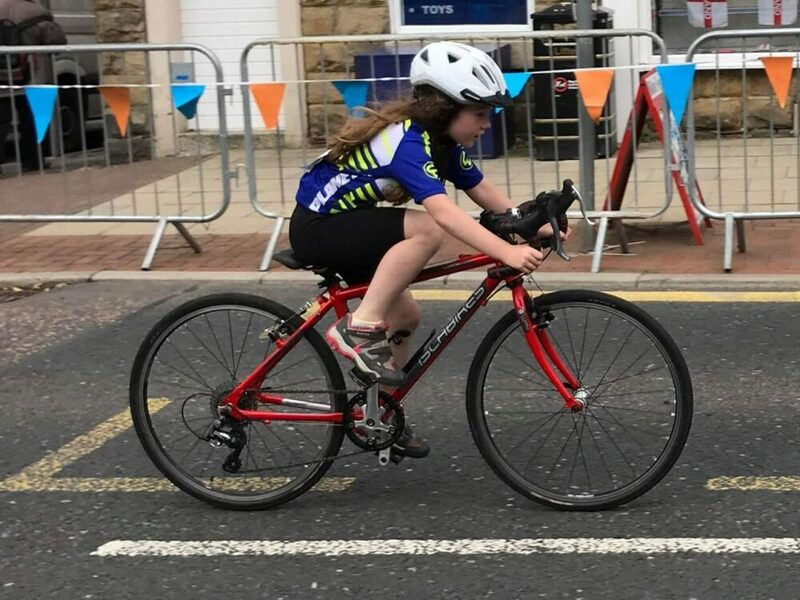 A massive thank you to all the followers of Cycle Sprog's Facebook Page who have shared their fabulous photos of their daughters and granddaughters enjoying their cycling. We still need photos of girls enjoying their cycling on other brands, so do please get in touch if we've missed out your favourite. Affiliate Disclosure: In order to fund this website, we use affiliate marketing. This means that some of the links on this page will pay us a small commission if you click through and make a purchase. It's not all links though as we recommend bikes because they're good, not because we make money (in fact we'd make far more plugging cupcake and princess bikes!) Thanks for your support by purchasing through the links on the page. This post was first published in September 2018 and was updated March 2019 to reflect current stockists.